Groton, CT – BauerFinancial, Inc., the Nation’s Premier Bank Rating Firm, proudly affirms that Chelsea Groton Bank has once again earned its highest (5-Star) rating for financial strength and stability. Earning a 5-Star rating indicates this bank excels in areas of capital adequacy, profitability, asset quality and much more. Earning and maintaining this top rating for 98 consecutive quarters puts Chelsea Groton Bank in the Top 10% of the banks in the nation. In fact, reaching this milestone gives Chelsea Groton Bank an even higher designation as a “Sustained Superiority Bank”, a title reserved specifically for Top 10%. Chelsea Groton Bank has been making its neighbors its number 1 priority since 1854. Today, after 164 years, it is creating a better banking experience for customers through several conveniently located branches throughout New London County, a loan production office in Hartford County, and online at chelseagroton.com. BAUERFINANCIAL, Inc., Coral Gables, Florida, the nation’s leading independent bank and credit union rating and research firm, has been reporting on and analyzing the performance of U.S. banks and credit unions since 1983. No institution can pay for or opt out of a BauerFinancial rating. Star-ratings are all available for free at bauerfinancial.com. 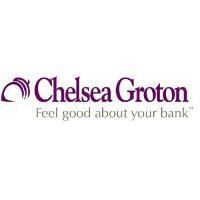 Based in Groton, CT, Chelsea Groton Bank is a full-service mutually owned bank with over $1.1 billion in assets. Chelsea Groton Bank’s products and services include consumer banking, business banking, mortgage and business lending, cash management, financial planning and financial education classes. With 14 branch locations throughout New London County and a Loan Production Office in Hartford County, Chelsea Groton Bank also provides online and mobile banking, 24-hour telephone banking, and nationwide ATM banking for individuals, families and businesses. To learn more, please visit chelseagroton.com. Member FDIC. Equal Housing Lender.